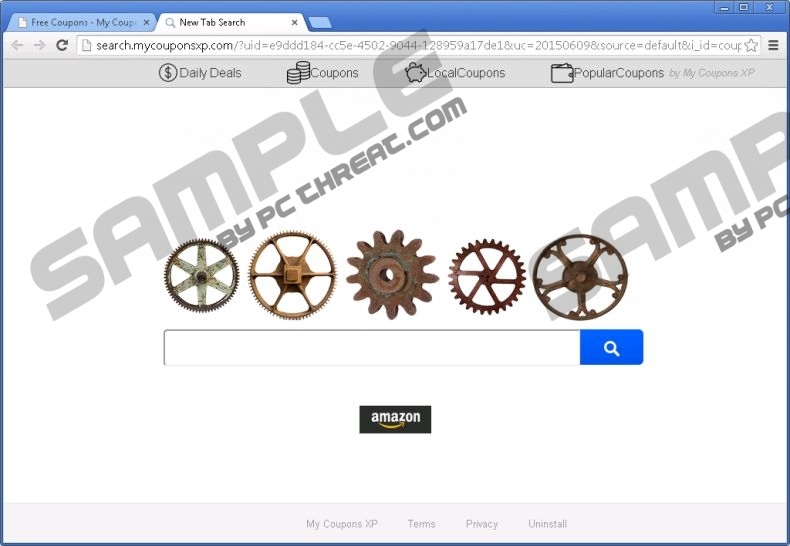 Our research team has found out that a new malicious search engine known as search.mycouponsxp.com is roaming the web lately. If you encounter this search engine active on your web browser, you should take immediate measure to remove it. This is so because our researchers have found out that this search engine is a malicious one and will in no way improve your Internet searches. Unfortunately, most users get their operating system infected with this Internet-based infection because they lack the necessary knowledge about the virtual security. This is why within this article we provide virtual security tips that should help you avoid getting your PC infected. Additionally we provide further information regarding the functionality of this search engine and a detailed removal guide that is easy to use so it will help you delete search.mycouponsxp.com in no time at all. It is important to note that in most cases search.mycouponsxp.com is distributed via bundled installers. Such way of spreading dubious software is very popular nowadays. Thus, taking preventative steps is imperative to improve your virtual security. First of all, make sure to avoid various third-party download third-party websites and websites associated with online piracy. This is crucial since such sites are the primary source of software bundles. Additionally, you must always pay as much attention to every installation procedure. Make sure to always choose the advanced installation since this way you would be presented with maximum information about the setup processes. Also, you might even be able to cancel the installation of any unwanted third-party program. Lastly but most importantly make sure to implement a reliable antimalware tool which would provide overall system security at all times; it would also warn you about various suspicious installers beforehand. As soon as search.mycouponsxp.com gains access to your operating system it will make some changes of your default browser settings. Your default homepage and search engine will be altered. All of these changes will be made without any notification. It goes without saying that these changes will make your web browsing experience an annoying one. This is so because you will no longer be able to use your preferred search engine as you will be forced to use a new one. This is also the case with the homepage; all of your browsing session will start on a homepage of not your choice. All of these changes are quite hard to revert. If you wish to restore the standard functionality of your web browser, you will need to thoroughly remove search.mycouponsxp.com. If you fail to do so, the browser changes made by this search engine will continue to bother you. Do not hesitate and use the removal guide that we provide below. The removal procedure of search.mycouponsxp.com is rather simple as you can delete it via Control Panel. This way you will be able to revert the changes that were made by this malicious search engine. Unfortunately, it has been discovered that in some cases manual removal might not be enough to remove every single bit of search.mycouponsxp.com. This is the reason you are advised to conduct an in-depth analysis of your operating system for potential leftovers once the manual removal is executed. Right-click the unwanted application and select Uninstall. Quick & tested solution for search.mycouponsxp.com removal.